Oh Barefoot, how I love your recipes. Your recipes are always simplistic, delicious and comforting. Truly, I do love the Barefoot. Her recipes always come out fantastic and they are not complicated. I’m not a fan of complicated recipes. I want something that tastes amazing, is fresh but easy to replicate. I have 5 of the Barefoot’s cookbooks and go back to them quite often for new and old recipes. Two of my favorite recipes from her are her chocolate cake and broccoli lemon pasta. The chocolate cake is my go-to cake and whenever I make this cake for people they beg me for the recipe. It’s rich and moist and oh so chocolaty. I will never try another chocolate cake recipe because this one is the bomb. The broccoli pasta is a weekly staple in my house. It’s one of those dishes that I could make in my sleep. My kids beg for this dish after we get back from a trip because it just reminds them of home. I recently received a new cookbook of hers called, How Easy Is That, and I decided to make one of her famous recipes, lemon chicken breasts. I have seen this recipe on various blogs and it always looked so scrumptious to me. I paired this chicken with the roasted fingerling potatoes that I posted the other day and some roasted cauliflower. This was a very traditional meat and potatoes meal but healthy at the same time. The perfect winter comfort food dinner. 3-4 boneless chicken breasts, skin on (6 to 8 ounces each) – I used 3 chicken breasts here as the breasts I bought were huge – Note: we are not fans of the skin but I cooked the chicken breasts with the skin on to keep them moist. We took off the skin after these photos were taken. 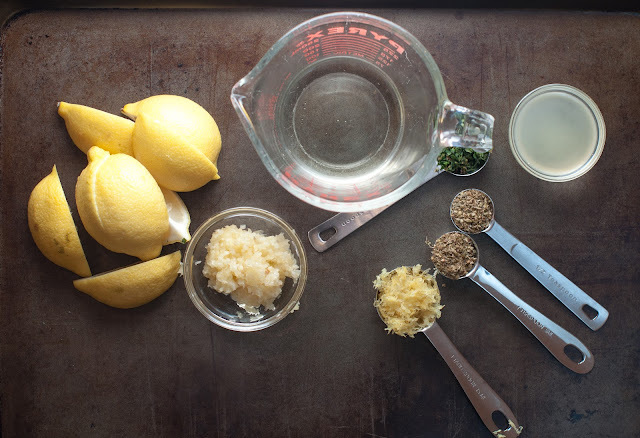 Peel and mince your garlic & zest and squeeze your lemons. Warm the 1/4 cup olive oil in a skillet pan over medium-low heat, add the garlic, and cook for just 1 minute but don’t allow the garlic to turn brown. Turn off heat and set aside. 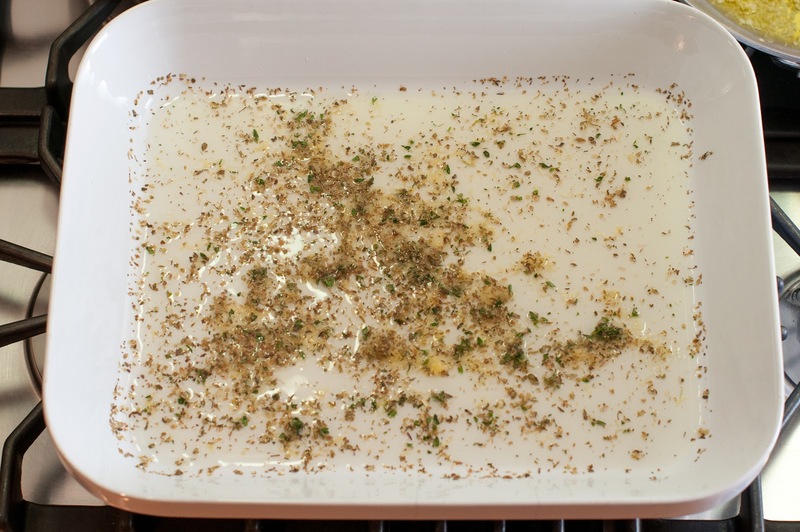 Get a 9 x 12 inch baking dish out and add the white wine, lemon zest, lemon juice, oregano, thyme, and 1 teaspoon salt. Rinse and pat dry the chicken breasts and place them skin side up over the sauce. 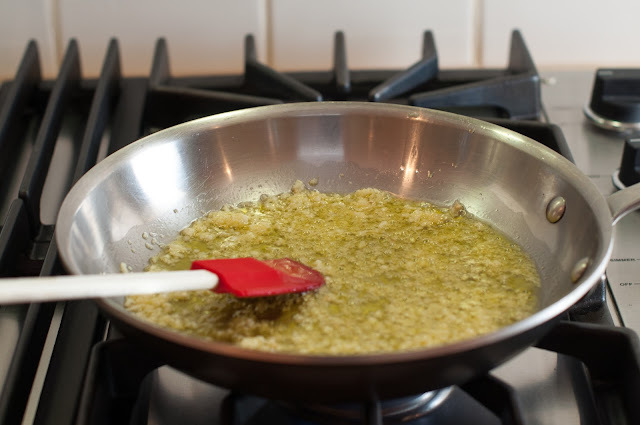 Brush or rub the chicken breasts with the olive oil and garlic mixture (use all of the garlic here) and sprinkle them liberally with salt and pepper. Cut the lemon in 8 wedges and tuck it in among the pieces of chicken. Sorry for the raw chicken picture below. It’s not the prettiest picture. Bake for 30 to 40 minutes, depending on the size of the chicken breasts, unit the chicken is done and the skin is lightly browned. If the chicken isn’t browned enough, put it under the broiler for 2 minutes. Cover the pan tightly with aluminum foil and allow to rest for 10 minutes. Garnish with fresh thyme if your presenting it to guests as it makes the chicken look so pretty! Make sure to pour some of the pan juices over each chicken breast when you are serving it up as it adds a bit more juice and flavor to the chicken. I actually poured all the pan juices into a serving bowl and the we each spooned up some and added it to our breasts throughout the meal. My family rated this meal a 10. I hope yours will enjoy this as well. Do you have any Barefoot Contessa cookbooks? If so, what is your favorite recipe of hers? What can i substitute for dry white wine? Hi Sherry! I wasn’t too sure about this question, so I googled it and saw this link…http://www.livestrong.com/article/534079-a-cooking-alternative-for-dry-white-wine/. Awesome! Everyone in my home more than just liked it, down to my fickle 4 yr old. Made it w” skin on, & glad I did so. I know it would’ve been sorta dry without it although am not a skin fan myself. Had it with your yummy fingerlings recipe as well as a bit of cranberry sauce and Colombian style Rice on the side. Thank u for helping get this tasty dish on our table! Have you ever tried this with skinless chicken breasts? I think I’m going to go for it… since that is what I already have in my fridge! I love Barefoot Contessa: my most frequently used recipes from her include: chicken piccata, roasted asparagus, roasted broccoli, roasted carrots, and roasted cherry tomatoes (can you see the theme here!). I LOVE the Barefoot Contessa! My favorite recipe is her Orzo with Roasted Vegetables. Hi Michelle! Barefoot rocks! I think I need to give that orzo and veggie dish a try! Thanks for the tip! Tried this recipe tonight and it was a huge hit with the family. They loved the lemony taste and the kids spooned additional sauce onto their chicken and cauliflower. (I made this with your roasted cauliflower, which they also really like). I think this recipe will become a staple. So tasty and simple. My favorite Barefoot Contessa recipe is probably her apple crisp from the Family’s Cookbook which I love in the fall or winter when apples are at their best. HI Allison! I am so glad you and your family liked the recipe. Barefoot knows her stuff and her recipes never seem to fail me. I have yet to make her apple crisp. I have that family style cookbook so I will give it a try. That is one of my other favorite cookbooks of hers. I make the broccoli lemon pasta from there all them time. Thanks for your advices. You have inspired me a lot with this dish. Hi Zoe! I love Barefoot Contessa at Home and Barefoot Contessa Family Style. Those are the two that I go to the most. The Barefoot at home one has lots of great dessert recipes which would be right up your alley. I know a friend who is a big fan of Barefoot Contessa cookbooks. She said that most of the recipes in these cookbooks are savory. Now, after reading your post and seeing your delicious Lemon chicken, I think I should buy one of Ina’s cookbook to explore more in savory baking. Is there any good recommendation for a beginner like me? I agree with you! Ina’s recipes are always great. I will have to check out her new cookbook too! Love, love this Ina Garten recipe. I have made it several times, and it has never disappointed. I am so pleased to get the recipe. I love Ina Garten – she has the best recipes! This chicken looks wonderful. I may have to make it this weekend. YUM! Looks yummy and simple! How easy is that? 😉 I’ll be trying this one for sure. Looks like a great weeknite recipe, I will give it a try!! !